Our first course welcomed a father and son to the forge – both had received gift vouchers to take part. If you pop over to my facebook page (or see the bar over on the right) you can see a short video of the budding blacksmiths in action! 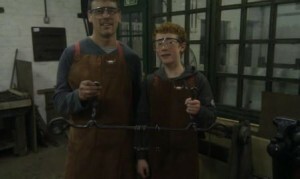 The first blacksmith course is due to take place this Saturday (7th Jan). I have been speaking to the attendees as I intend that every course will be bespoke to each person and that people can make something that will be relevant and useful to them. Also as part of this process I will need to manage expectations, we can’t quite manage a pair of driveway gates in our day-long session! Anyway, if you were going to come along, what would you make? Great to hear your ideas. I will be posting on here after each course and sharing photos and experiences so perhaps we can provide some smiles and some inspiration along the way!